Home / Hypocrites / Islam / Latest Post / Media / Public Interest / Religion / Secularism / Terror Has No Religion, Really? 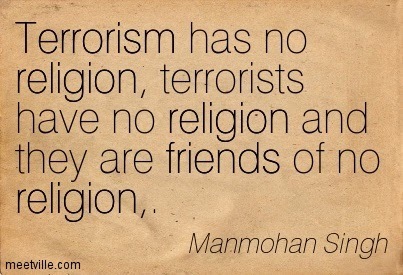 Terror Has No Religion, Really? In about last decade or so, the most bogus thing that I have heard, other than that Sharukh Khan loves to drive an i10, got to be the “Terror Has No Religion” line. 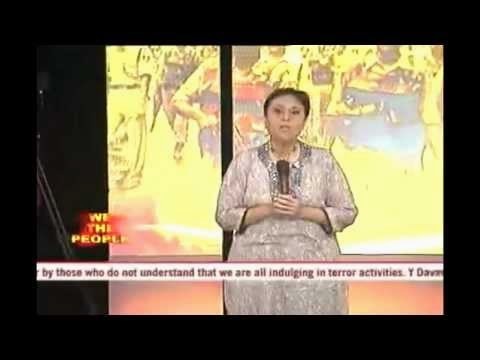 Post every terror attack, the secularists across the globe and more so in India, go about shouting to the city center that the latest terror act is an act against humanity and we must not do the mistake of attaching it to any religion. I agree partially to the howling of the secularists that the terror acts are against humanity but that acceptance must not blind us in calling a spade, a spade. I am not sure how many would agree with me, but I have a feeling, the growing terror acts is because of this basic absurd policy of playing ostrich to the ground realities. Had we addressed the root cause of this menace, perhaps we would have been living in a far peaceful world than we currently do. Every time innocents are killed in the name of religion, we have hundreds lining up in defense of this “Terror Has No Religion” ludicrousness. This very hysterical mentality in dismissing religion from terror acts points to the fact that, there is actually religion involved in most of the terror activities, if not all. Few even go ahead and address the perpetrators as misguided Muslims. “Terror Has No Religion” is promptly followed up by “Islam Doesn’t Teaches Violence” line. But irony, the secularists and the so called true Muslims don’t tell us, what exactly Islam teaches us then. After every terror plot I expected a learned Muslim to come forward and tell us the specific teachings of Islam, if they are any different from what the Al-Quidas or the ISIS of the world believe in but surprising enough, besides the standard lines of exonerating Islam from terror acts, I hear complete silence from the other side. Why none in our secularists or the learned Muslim clerics tell us the real teachings of Islam, if they are so different from what the terrorists believe in? Why just stop at – “Islam doesn’t teach”? How about going a step forward and ask – “What Islam teaches us then”? In the absence of any answer, I wonder, why I shouldn’t feel, the learnings of the terrorists are exactly in line with what Islam actually teaches. Let’s take Charlie Hebdo as a case study. The magazine was an equal opportunity offender or whatever that means. They have spared none, including Hindus by depicting a man caring more for his cows than his wife. They also have made fun of the Pope. But who went in to their office with Kalashnikovs? If not religion then what made only two so called misguided Muslim youths to go ahead and kill just about anyone in the magazine office? The same secularists who shouted to keep religion out of this particular mess were seen reasoning the fact that CH should have refrained themselves from offending religious sentiments, exactly half an hour later. But CH did offended many, including Islam. Then what made the reaction to come from a particular section? If the answer to this is the misguided learnings of the two Muslim youths then my question remains there to be answered – what is different the guided Muslims learn from Islam. If there is no one to answer me then I am left with no option but to believe, the real learnings of Islam are exactly reflected in the bloodsheds on our streets. Sorry, neither do I have patience nor I wish to read the so called good teachings of Islam by myself. To be frank, I have better things to do like most of us. It is about time we throw these standard lines of the real learnings or some nonsense to that effect to the nearest garbage dump and take the problem in its correct shape. 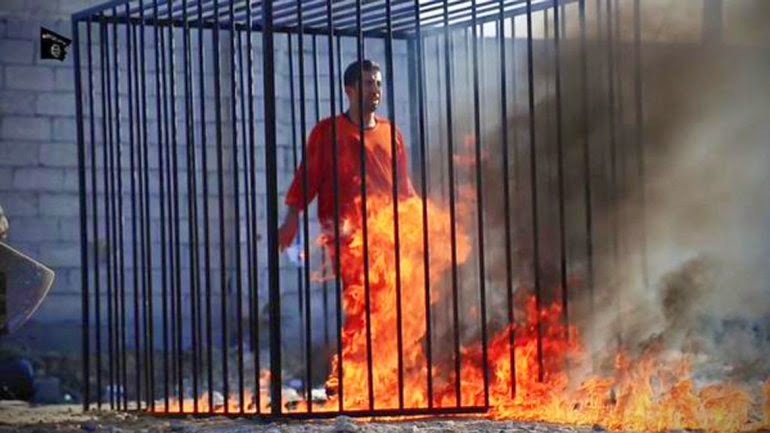 Yesterday the ISIS louts killed a Jordanian fighter pilot by burning him alive. I never came across anything more barbaric than this. I agree, barbarism has no specific religion but then such barbarisms are getting common with these trouble makers. And, to even surprise more, the same vicious lot has genuine or that is what they think, reasons for such barbarism. Since the pilot did act against the Caliphate, which is the epitome of infidelity as per Islam, deserves what every infidel should. That is to be burnt to hell. Who taught the ISIS jokers these very fine points? Not long back, the same lot killed two people by throwing them from a tall building just because they were gay. Again the excuse for such barbarism was the holy book where being gay is considered as an unpardonable crime that should lead to the most horrific death. Now, don’t tell me, the ISIS clowns are entirely misguided and galaxy away from what Islam teaches. If so then, I must be told if there are two versions of the holy book available in the market; one that the terrorists refer and the other that our secularists and terror sympathizers refer. As far as I know, the holy book has one single version followed by all Muslims in the world. Or am I missing something here? But our Indian secularists have one more peculiarity that is not seen anywhere else. In one case, the Indian secularists point finger at CH for being too liberal in insulting Islam while they are fine with MF Hussain and his deplorable paintings. They defend or at least sympathize with the Paris attackers but have serious problems with someone who went to courts to stop the sale of Wendy Doniger’s book. It only takes hypocrisy its finest granularity for one to sympathize with someone who kills in protest but object someone who takes the shelter of law. MF Hussain running away like a coward from this country must be blamed on the people who objected his paintings but Charlie Hebdo, because of their acts and actions, called on themselves the wrath of some so called misguided Muslim youths. In similar cases of religious profanity, our secularists take sides of the Muslims, irrespective of them being the perpetrator or the victim so that the nonsense called “Terrorism Has No Religion” could be peddled further. The fraudulent ideology of sheltering the real problem creators has in fact worsened the situation. Somehow, in the name of this secularism, almost all are expected to tolerate the intolerants. At the same time, everything related to Hindus could be and should be bashed without any fuss. But history is a proof that there are seldom any achievements in tolerating the intolerants. In fact it is always the tolerant that get killed at the end of the day. This very shoddy attitude of playing fire with kids gloves lead to the intolerants become more intolerants and that is precisely what is happening. The so called misguided Muslims seem to have problem with everything now. Same could be said about our media and Bollywood. Both these fraternities are badly infected with this “Defend The Perpetrators” syndrome. This is the reason why, even before the certified secularists could shout, our media and the morons therein start defending the terrorists. The similar liberal attitude in defaming Hindus is also observed. Case in point is the movie PK and how it is defended by these secularism flag bearers. I at times wonder, what would have been the scene, had our media and Bollywood been liberal in showing the facts about Islam and the terrorists that come from that religion, let alone defaming Islam like they intentionally and so abjectly do to Hinduism. Just facts alone would have inspired many misguided Muslims to visit their TV studios and Movie shooting studios with fully loaded Kalashnikovs. But those prospects don’t scare these secularists, who feel the danger would wed off by burying their heads in sand dunes called hypocrisy. What if few Hindu youths get as misguided as many Muslim youths do regularly? What if those misguided Hindu youths enter their studios and kill one or a dozen of them? Perhaps the nonsense of unnecessary Hindu bashing in the name of free speech would stop at once. This is the specific reason why these self-styled idiots flout secularism when it comes to Muslims because they see Charlie Hebdo getting repeated in their own studios but take all the liberty in maligning Hinduism. By the way, I am not advocating violence but just drawing some parallels which our secularists are too scared to draw. All said and done, just keep it in mind – Terror and Terrorists Still Don’t Have Any Religion. It is only a matter of coincidence that, most of them just belong to one religion. Plain and simple coincidence. Nice article. I think Islamic cleric should do 'dharm sudhar' if there are verses which is inciting violence then they should accept it and mend it or clarify it. So that the so called misguided muslims take the path of peace. In every TV channel Maulans come and say "Islam iski izzazat nahee deta". If it is true then why they are not redefining the meaning of Jihad. If making cartoon of Mohammad is blasphemous then what the muslims should do they should explain this to the muslims. 1. The definitions of words like jihad, kafir are vague and interpreted according to convenience of terror groups' ideology. 2. The religion is essentially used as a tool to acquire power. Lack of stern opposition from saner parts of society perpetuates this. 3. The viral brand of salafism treats other Islamic sects like Ahmadias, Shias and Sufis as Kafirs and doesnt have any compunction in killing them by hundreds. If this is the case, there is no need to talk about Hindus, Christians and other non-Muslims. 5. The money minted through oil exports by Gulf countries is essentially laundered to fund terrorism. Those who want to have a safer life away from this insanity should find a way to dry this up.